They may cause you to shed a few tears, but Americans certainly do like their onions, eating 20 pounds per person in 2009, according to the National Onion Association. That's up 8 pounds since 1982. Both red and white onions are sweet and mild and make flavorful additions to a variety of dishes, both raw and cooked. 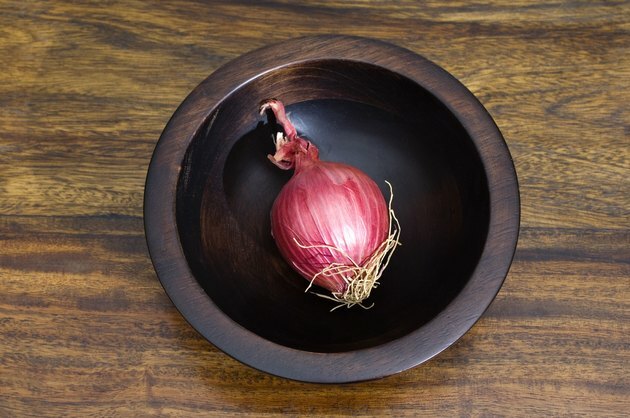 When it comes to nutrition, the red onion slightly edges out the white onion. When it comes to calories, both the red and white onion make low-calorie choices. A 100-gram serving of raw red onion contains 37 calories, while the same serving of white onion contains 42 calories. Including more low-calorie foods like the red and white onion in your diet can help you keep calories under control, which helps with weight management. The red onion, with 2 grams of fiber per 100-gram serving, is a slightly better source of fiber than the white onion, with 1.2 grams of fiber in the same serving. While neither onion is particularly high in fiber, both can help you meet your daily needs of 14 grams for every 1,000 calories eaten, or 28 grams on a 2,000-calorie diet. Americans only meet about half their recommended fiber needs, according to a 2009 article published in "Nutrition Review." Getting more fiber in your diet significantly reduces your risk of heart disease, diabetes, high blood pressure, obesity and stroke. Both red and white onions are a good source of vitamin C, meeting more than 10 percent of the daily value in a 100-gram serving. Vitamin C is an essential water-soluble vitamin your body needs to make collagen, which is a protein that helps with wound healing, and to support immune health. It is also an antioxidant that helps limit the free radical damage to your body. In addition to vitamin C, both the red and white onion meet 2 percent of your daily value for calcium, and the red onion meets 2 percent of the daily value for iron. Both the red and white onion contain the flavonoid quercetin, an antioxidant that might protect you from heart disease, stroke and certain cancers. Concentration of the flavonoid is greater in the dry, outer layers than the inner layers of the onion. The red onion has higher amounts of quercetin than the white onion, according to the National Onion Association.